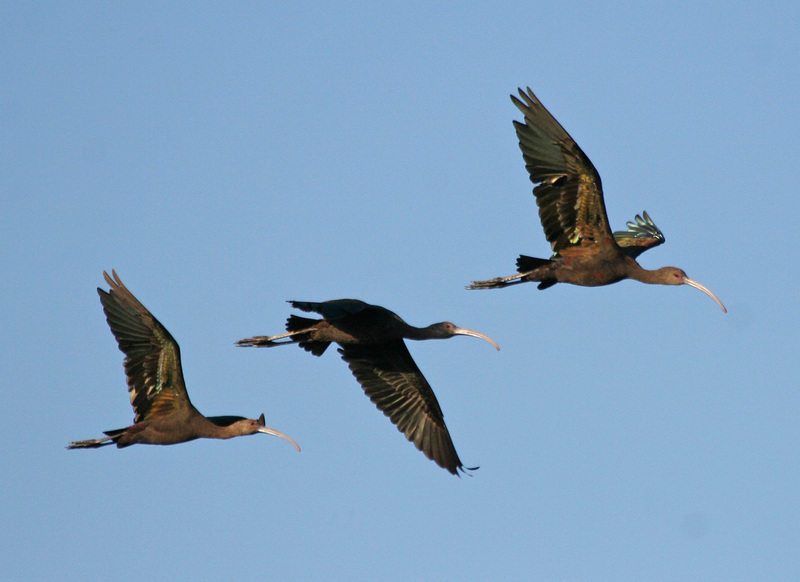 I was out walking at the Yolo Bypass National Wildlife Refuge, yesterday, and was treated to the sight of a flock of about 30 White-faced Ibis (Plegadis chihi) flying overhead. This is one of the species that I always look forward to seeing in the summer, here in Central California. They are beautiful and elegant birds, and seeing them always seems somewhat exotic, like you are in the tropics somewhere. The breeding range of this ibis is highly variable from year to year depending on water levels and food availability. Usually colonial breeders, very large numbers of these birds may nest in a general area one year when local conditions are favorable, and none may be at that spot the next. Four years of drought, such as we are experiencing here in California, will no doubt be hard on this species. The total range that they can potentially breed in encompasses a huge area of the western U.S. This makes monitoring of their population levels rather hard because any survey would have to regularly cover the entire potential breeding area, some of which will be occupied and some not, but there is no easy way to tell before you get there. All the area would need to covered to accurately count the actual number of birds in any given year. No small task! Due to the fact that the White-faced Ibis often feeds in agricultural lands, they may be exposed to many of the pesticides and fertilizers that are used in growing our food. This heightened exposure potential makes them a “canary in the coal mine,” for pollution and so is a particularly important species to monitor to assess habitat quality. In fact, the White-faced Ibis suffered a major population decline due to DDT causing egg shells to thin much like the more famous examples of the Peregrine Falcon and Bald Eagle. This species’ winter range mostly resides in Mexico, and little or nothing is known about this part of their annual cycle, a fact that is true of so many bird species. A wonderful bird that I hope you all can get out and enjoy! 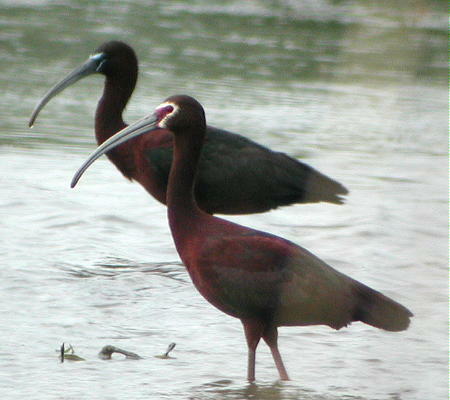 One adult White-faced Ibis (center) and two hatch year birds.